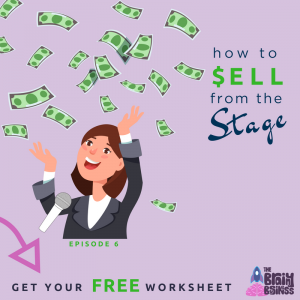 Last week, I talked about The Truth About Pricing, you might want to listen to that episode before we dive into today’s episode about how to sell from the stage. Both are built on the same foundation. In the truth about pricing “it’s not about the cookie,” there were five components that I talked about. I have always loved being on stage from acting as a child to singing and improv classes. I don’t think I would be where I am today without this background. When it comes to selling from the stage, the same five components apply. I’ll be talking about these components of the scent of the cookie, free samples, perceived ownership, today only, and buy three and get one free as they apply to selling on the stage. [02:28] Thanks to all of my new listeners and downloads. [03:18] I love being on stage and grew up acting and dancing. I was also a vocalist and even competed in Opera. I am also in the Screen Actor’s Guild and sang with a country band in Seattle. I also sang the National Anthem for the Seattle Mariners. [06:30] I know how to be on stage and work with an audience. [07:24] Being on stage is no different than selling. [07:45] A quick recap of last week. [07:58] How an expert at selling can get a customer drooling like Pavlov’s dog where an amateur may not even be able to sell the same product. [08:15] It’s all in the delivery and in the right order. I unlocked this method in episode 5. [11:02] How the scent of the cookies forces your conscious brain to do what the subconscious wants it to do. [11:52] You want to build your pricing on this foundation. Even if you are selling on stage. [12:32] Conversations are based on this concept as well. Buying and selling is not always about exchanging money. [12:56] Next week, I will extend this scenario to change management and non-monetary conversations. [13:29] The five components were the scent of the cookies, the free sample, perceived ownership, today only, and buy three get one free. [14:07] A master of selling can get the audience excited about anything that they want to sell. [15:08] The smell of the cookie flags your conscious brain. If you are a speaker, the audience is focused on you. [16:16] Using the 80/20 rule when speaking. 80% of your sales will come from 20% of your audience. [17:40] The scent of the cookies is the title and description of your conference. [20:55] Have an interesting title that is different and makes people want to learn more. [23:42] Incorporating questions into your titles and descriptions. This engages the mind differently. Use questions that will make people say yes. [27:00] The free sample phase of public speaking is when you give your customers a taste of what it would be like to work with you. [28:12] Perceived ownership or reminding the audience of things that are important. [31:34] There is a delicate balance between selling and sprinkling in what it would be like to work with you. [33:19] Today only or a special offer if you act now. This is the concept of scarcity. Watch infomercials for an example of this. They work, because they speak to the subconscious part of the brain. [37:01] The average of people who ask for refunds is about 5%. [37:30] Money back guarantees encourage buying and spending more. [38:44] Buy three get one free. The brain likes things that sound better. The way you frame the message impacts with the brain hears. [40:01] FRAMING is everything – and just as with pricing, it isn’t what you say…it is how you say it. [40:57] Two types of public speaking. The hard pitch uses the tactics of relativity, anchoring, and adjustment. [41:58] The informational pitch is more of a long term strategy and it is about 80% of presentations. This is the tactic I take. [42:43] Sprinkling in additional resources that can further learning go way beyond the presentation. [43:24] Offer the one thing that you would want your audience to do. [44:41] In most public speaking the sale is actually a freebie that gets people into your family or on your list. [46:35] This method in these formulas work. You can use the free worksheet to implement this strategy. Do Lead Magnets Work and Do You Need One?